For many home gardeners, apples and autumn go together. When summer fades, it is time to begin anticipating crispy, crunchy ripe apples. With the newer dwarf apple trees, growing and harvesting apples has never been easier because the apple trees do not grow over 10 feet in height. Choose either early-season or late-season apple trees for an abundant apple harvest at the end of the summer or during the autumn months. Tend the apple trees carefully during the growing season. Make sure that young apple trees receive adequate and regular water so that root systems establish well. Fertilize in the spring with a general fertilizer (10-10-10), following package recommendations for the size and age of your apple trees. Place mulch around the base of the trunks during the growing season to insulate the roots from hot weather. Prune apple trees yearly following specific recommendations for the varieties of apple trees you are growing. Watch the apple trees for indications that it is time to harvest the apples. Some apple tree varieties will start dropping apples to the ground when they are ripe. Look for apples that have completely turned the color they are supposed to be. Pick one apple and slice it open. If the apple seeds in the center are a dark brown color, the apples are ripe. Taste the apple; if it is juicy and crisp, the apple is ripe. Pick apples carefully from the branches. Twist the apples around and up at the same time to remove them from the branches. Try to keep the stems on the apples, if possible, to help the apples stay fresh longer. 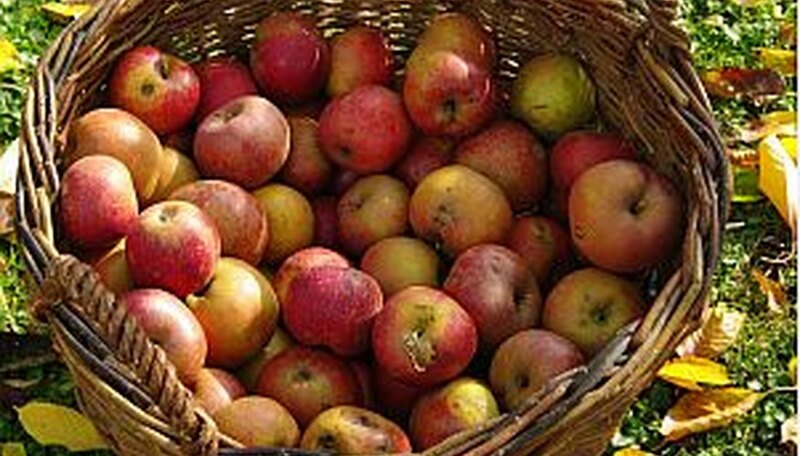 Place apples gently into the bushel baskets to avoid bruising them. Place small quantities of apples in the refrigerator to keep for several months. Place large quantities of apples in a cool, dark location to store for several months. A root cellar or cool basement is an ideal storage spot. Do not store apples near potatoes, however, because potatoes release a gas that promotes apple spoilage. Wrap each apple individually in newspaper to store apples in a cool location over a winter.